State of the Dream 2012: The Emerging Majority co-authors Wanjiku Mwangi and Tim Sullivan have an in-depth discussion of the report with WBAI Pacifica "Talk Back!" host Hugh Hamilton on his Martin Luther King, Jr. Day broadcast and fundraising drive. 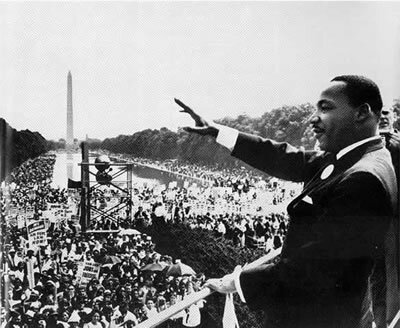 By the year 2042, will Martin Luther King's dream of racial equality be within reach? UFE's ninth annual MLK Day report, State of the Dream 2012: The Emerging Majority offers a glimpse at a future that could be—one that should be of great concern to people of all races. This timely publication is being covered online, in print and in broadcast media. Click through for a sampling. The list will be updated as new coverage emerges. With a new year before us and new battles ahead, we at United for a Fair Economy and Responsible Wealth are proud to announce to you our forthcoming book, The Self-Made Myth — And the Truth About How Government Helps Individuals and Businesses Succeed, available nationally on March 5th. This week, the Congressional Progressive Caucus (CPC) introduced the Restore the American Dream for the 99% Act. But, this plan isn't just for the 99 percent; it's for all 100 percent of us. Learn more with this bill summary. Today, Rep. Jim McDermott released the Sensible Estate Tax Act of 2011, and we've got his back. The bill is an effort to raise taxes on the top 1% to benefit the 99%... literally. Yahoo! Income Inequality is Reaching Mainstream Media! UFE has been working to raise public awareness of economic inequality for 15 years, so this is certainly call for excitement. Yahoo News' video on income inequality, the first in their "Remake America" series, is accessible and deserving of the most views you can help to generate. As word spreads about Occupy Wall Street, it's getting harder and harder for the typically apolitical to ignore it. Because my Facebook wall has become something of a clearinghouse for Occupy-related news, I frequently field inquiries on what it's all about. Here's the most recent. Each week, UFE's online news hawk, Tim Sullivan, will share a list of stories that he finds interesting. Tim's first round-up includes the latest on Occupy Wall Street, the action in our own backyard at Occupy Boston, the delusions of Wall Street insiders and [more] reasons to be very upset with Citigroup. Enjoy! Occupy Wall Street is a budding movement that can be the tipping point for what we at UFE have been working toward. For a decade and a half, we have fought to push inequality to the center of the tax and economic policy debates in order to build an economy that works for all people.